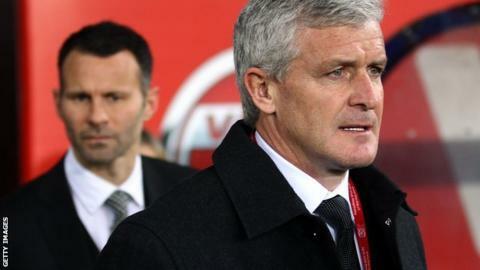 Stoke City boss Mark Hughes has backed Ryan Giggs as a future manager of Manchester United, amid reports that he could replace Louis van Gaal. United, who have lost their last three games, are away to Hughes' Stoke on Boxing Day. Former Wales boss Hughes spent 13 years as a player at Old Trafford and played alongside Giggs for club and country. "Given his playing career, you would say he's got an outstanding chance," Hughes said. Giggs, 42, made a club record 963 appearances for United and played 64 times for Wales. He was United's caretaker manager for four games in 2014 and has been Van Gaal's assistant since then. "His ability as a manager is not clear yet - we don't know because he's not had the opportunity yet," Hughes added. "He's getting an education now. He had it obviously being around Sir Alex Ferguson for so many years, and now he's assistant manager." Former United defender Phil Neville says the club are facing a "reality check" under Van Gaal this season, but believes the club should stick with the Dutchman. Hughes, who had two spells as a player at Old Trafford, highlighted the experience of the former Ajax, Barcelona and Bayern Munich coach, but said even that may not be enough to save him if United's struggles continue. They have dropped to fifth in the Premier League and have gone six games without victory in all competitions for the first time since 1998. "Louis van Gaal has got a fantastic CV," Hughes added. "He's managed top clubs right around Europe. "He knows what he needs to do but he's in that period of transition that needs navigating and getting through to the other side. "I said last week when Jose [Mourinho] lost his role that no-one is immune. It doesn't matter what you have done in the game previously, and his record as a top-line manager is exceptional, you have to win football matches. "He has been in the game a long, long time and he knows better than most if the results and perception is you are not doing particularly well, you come under pressure. He understands that. We all do."